Reality is the substance of life and truth reflects what is real. Yet, the nagging question persists – is there such a thing as absolute truth? This is exactly what the Bible claims for itself, that it is the source and foundation of truth. Now, of course, claims without verification are meaningless. So, the question is – can this outrageous claim by the Bible be verified in the crucible of reality? This study probes the answer to that question. 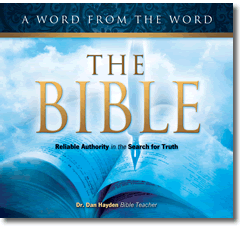 These lessons are based on the book DID GOD WRITE THE BIBLE? by Dan Hayden. Reading the appropriate chapter as indicated for each lesson will greatly enhance the value of this study.